Ludwig van Beethoven (1770 - 1827) is a giant of the European musical tradition. He first gained fame in his twenties as a piano virtuoso, but the progressive loss of his hearing threatened his brilliant career. Despite this seemingly insurmountable handicap, Beethoven continued to compose, and many of his most well known and profound works were created after he had become stone deaf. Beethoven only ever heard this music in his imagination. A sense of thunderous tension and grand exultation pervades much of Beethoven's work - reflecting the struggle of his creative process - yet he also produced some of the most delicate, gentle music ever written. His popularity is as strong as ever after nearly two centuries, because his music gives expression to the struggles in which we all share, and speaks to all that is deepest and noblest in the human soul. 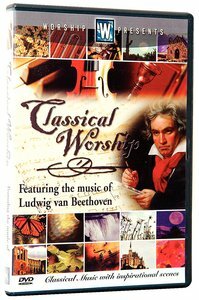 This DVD features inspirational footage of nature and sacred architecture, all accompanied by some of Beethoven's best loved compositions. They range from the high drama of Symphony #5, to the exultantly epic Ode to Joy, to the reflective solemnity of the 'Moonlight' Sonata. About "Ludwig Van Beethoven (Classical Worship Series)"